Your windows are your eyes to world! And from the outside, bright sparkly clean windows also say much about you and your home. Not a small detail, clean windows add curb appeal and friendliness to your surroundings. They tell your neighbors that you care, and they signal to visitors that your home is well cared-for and kept up properly. 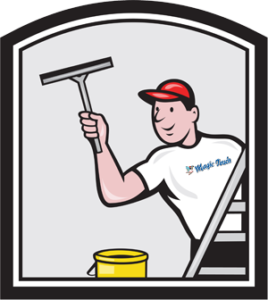 At Magic Touch we offer professional residential exterior window cleaning for windows up to 20′ high from the ground. We are insured and take great care to protect your property while we perform our cleaning magic. Our team uses environmentally friendly cleaning solutions and products that are safe for your kids, plants, and animals. Please call us for estimated pricing for your windows!